Albany Western Australia points of interest. 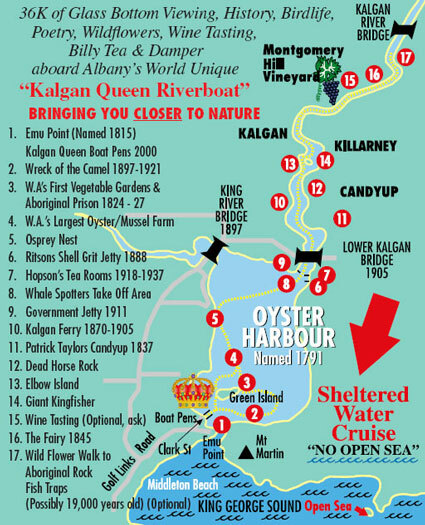 No trip to Albany is complete without a cruise on the award winning Kalgan Queen. Starting at Emu Point you meet the Pelicans and often get to see the Giant Rays through the glass bottom of the boat and thats before you even start! The Captain will point out all the points of interest on the cruise. Gaze through bottom at the remains of an old wreck, then past Green island which was Western Australias first vegitable garden at the start of the settlement in 1827 and is one of only four permanent Pelican nesting grounds in WA. Look up as Sea Eagles often swoop down to catch a fish near the boat. Sometimes they see Dolphins and Seals as well.Listen to the poems of the Kalgan from you Captain as well as a full comentry on the history, Anzac, wildlife and so much more. You can learm more about Albany in four hours tha some locals do in a life time. Next into the Kalgan River which is said to be the oldest continually running river in the World. Your recommendation is now our best advert! As you cruise past Candup one of the first farms in Albany you will find out why so many names end in up. On too a wagon for a quick trip on the banks of the Kalgan where you see Kangaroos in the wild. Then Billy Tea, Coffee and Captain Kalgans famous hot Damper. Before a relaxing trip back to Emu Point. It is said a picture speaks a thousand words so do take the time to look at these. Just Crusing, fantastic just ask anyone who's been!! Functions and Private Charters - P.O.A. Welcome to four hours of fun! “We welcome you” to our tour where you can see and learn more about Albany, it’s history wildlife and beauty in four hours than some people do in a life time! at the reins and Captain Jack at the wheel you just have to watch out for Jon the Con and Mr Deadringer. 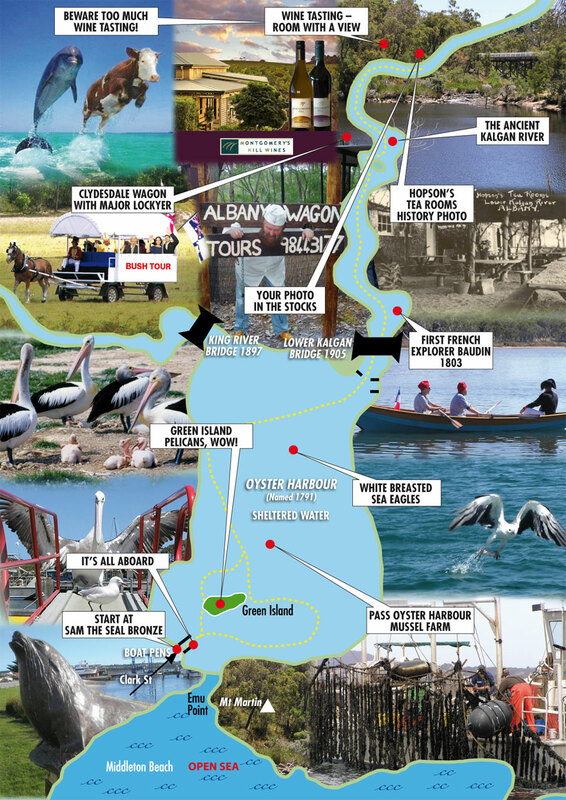 Cruise the “Sheltered Waters”of Oyster Harbour and the ancient Kalgan River, marvel at the wildlife and scenic beauty. Then a wine tasting sensation at Montgomery’s Hill Vineyard. Wagon train through the bush with Major Edmund Lockyer to a light meal of Billy Tea, Coffee, Hot Damper and homemade soup at Clyde’s Tea Rooms on the bank of the river. Then return by boat to Emu Point Boat Pens. Departs from Emu Point Boat Pens right beside the Sam the Seal Bronze. Cruise on a sheltered water boat trip across Oyster Harbour and up the Ancient Kalgan River. Wine taste the Award winning wines at Montgomery Hill Vineyard while admiring the stunning view. Wagon through the bush and Vineyard with Major Lockyer at the reins of the mighty Clydesdale. Dine on Billy tea, coffee, Hot damper and homemade soup at Clyde’s tearoom on the banks of the Kalgan, before returning by boat to Emu Point Boat Pens. Times prices and how to book. on West Australia Albany Riverboat Kalgan Queen Scenic Cruises. Oyster Harbour, the Kalgan River, Emu Point, Ship Wreck of the Camel, Green Island, Western Australia’s first vegetable garden, Green Island, was an Aboriginal prison and is a Pelican breeding reserve, one of only four permanent ones is West Australia. WA, biggest Oyster farm and they also farm Mussels. The Osprey Nest, is known as a stack and explore George Vancover, saw one on his arrival in 1791. Very near to, Point Possession. Ritsons shell grit jetty, was built in 1870 to load shell on to the Lighters, which is a shallow draft barge used on the, Kalgan River, between 1870 and 1935. Hopson’s Tea rooms, 1918 to 1937. Whale spotters, take off area where John Bell took off to spot Whales for the Whale chasers. The Chanes, one to five. The Government Jetty, built 1810 to off load timber planks to build a 22-mile water pipe line from Black Cat creek to Albany. Kalgan River Ferry, ran from 1870 till 1905 when the Kalgan Bridge opened. Patrick Tailor’s, Candyup, built 1837 where he lived with his Wife, Mary Bussell. Dead Horse Rocks, not the place to swim your Horse across. Nicholas Baudin said there was an Island in the Elbow of the river. Now Elbow Island or Honeymoon Island. The home of the Giant Kingfisher. Wine tasting at Montgomery’s Hill Vineyard. The Fairy, the largest boat/ship built on the Kalgan. Wild Flower walk to Aboriginal Rock fish traps possibly 19000 years old. Still no secret ingredient on this page, but your getting closer... Did we say fun? And that’s only what is on the map!